Michael Kightly's third goal in as many games earned Championship strugglers Burton a crucial victory over Norwich. Timm Klose's error gifted Albion the lead as Lasse Vigen Christensen nicked possession and squared for fellow Fulham loanee Cauley Woodrow to tap in. City levelled when Steven Whittaker's wild shot deflected in off Cameron Jerome for his 11th goal of the season. But Kightly grabbed a stylish winner, flicking the ball past Russell Martin before lifting a shot over John Ruddy. Norwich came into the game on a six-game unbeaten league run, but were let down again by their poor away record. The Canaries have lost nine times away from Carrow Road in the league this season, only Forest and Rotherham having conceded more Championship goals on the road. Both Burton goals came against the run of play, but the hosts could have won by a greater margin, with Lloyd Dyer blasting over and Martin clearing as Jackson Irvine prepared to pounce. Nigel Clough's side, who have conceded in 16 consecutive league matches, protested strongly against City's sole goal, claiming Jerome had handled. Yet the Canaries, who had 64% possession in an often scrappy game, felt they should have had a stoppage-time penalty when Wes Hoolahan was bundled over. 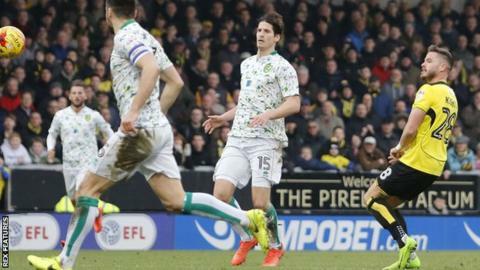 Burton's third win in five league matches lifted them to 20th, four points clear of the bottom three, while Norwich slipped to seven points off the play-off places in seventh. Burton manager Nigel Clough: "That's right up there with our best results this season, especially in the context of where we find ourselves in the league playing against a very good side as we did today. "It was just about pure hard work and the desire to stop the opposition playing. The two goals are great quality from our point of view, especially the second one. "It was the work-rate today that did it and I thought that was outstanding. There was a real desire at the end to see it through and get the three points." Norwich boss Alex Neil: "It's hugely disappointing. We got into good areas at times, but the final ball wasn't good enough when we got it in there. "We had most of the game and Burton's centre-forward (Cauley Woodrow) gets man-of-the-match. "When we scored we looked as if we are going to go on and win the game. "We gave the ball away in a stupid area from our own throw-in and then didn't defend well enough." Match ends, Burton Albion 2, Norwich City 1. Second Half ends, Burton Albion 2, Norwich City 1. Corner, Norwich City. Conceded by Luke Murphy. Delay in match John Mousinho (Burton Albion) because of an injury. Foul by Timm Klose (Norwich City). Corner, Norwich City. Conceded by John Mousinho. Attempt blocked. Mitchell Dijks (Norwich City) right footed shot from outside the box is blocked. Assisted by Jonny Howson with a headed pass. Substitution, Burton Albion. Shaun Barker replaces Lasse Vigen Christensen. Attempt missed. Luke Varney (Burton Albion) right footed shot from the right side of the box is too high. Assisted by Marvin Sordell. Attempt missed. Jonny Howson (Norwich City) right footed shot from outside the box is close, but misses to the right. Substitution, Norwich City. Kyle Lafferty replaces Alex Pritchard. Attempt missed. Lloyd Dyer (Burton Albion) left footed shot from the centre of the box is high and wide to the right. Assisted by Luke Varney with a cross. Foul by Luke Varney (Burton Albion). Substitution, Burton Albion. Luke Varney replaces Cauley Woodrow. Substitution, Burton Albion. Lloyd Dyer replaces Michael Kightly. Substitution, Norwich City. Josh Murphy replaces Yanic Wildschut. Marvin Sordell (Burton Albion) wins a free kick in the attacking half. Attempt blocked. Alex Pritchard (Norwich City) left footed shot from outside the box is blocked. Assisted by Cameron Jerome. Mitchell Dijks (Norwich City) wins a free kick in the defensive half. Foul by Lasse Vigen Christensen (Burton Albion). Tom Flanagan (Burton Albion) wins a free kick in the defensive half. Attempt missed. Alex Pritchard (Norwich City) right footed shot from outside the box is close, but misses to the right. Assisted by Cameron Jerome with a headed pass. Cameron Jerome (Norwich City) is shown the yellow card. Goal! Burton Albion 2, Norwich City 1. Michael Kightly (Burton Albion) right footed shot from outside the box to the centre of the goal. Assisted by Cauley Woodrow following a fast break. Corner, Norwich City. Conceded by Tom Naylor. Corner, Norwich City. Conceded by Tom Flanagan. Attempt blocked. Cauley Woodrow (Burton Albion) right footed shot from outside the box is blocked. Assisted by Michael Kightly. Goal! Burton Albion 1, Norwich City 1. Cameron Jerome (Norwich City) header from the centre of the box to the bottom left corner. Assisted by Steven Whittaker. Attempt missed. Steven Whittaker (Norwich City) right footed shot from the right side of the box misses to the left. Assisted by Cameron Jerome. Attempt missed. Cameron Jerome (Norwich City) header from the centre of the box misses to the right. Assisted by Alex Pritchard with a cross following a set piece situation. Russell Martin (Norwich City) wins a free kick on the right wing. Foul by Tom Flanagan (Burton Albion).